Your skin is not just a container but a remarkably sophisticated organ which regulates losses of heat and moisture from your body, stores and excretes surpluses from metabolism and receives sensory impressions. Despite its permeability it is a very effective barrier against microbes and moisture and can regulate the penetration of sunlight to the tissues inside. It wears tirelessly and will grow into a form appropriate to the physical work expected of it. Its elasticity enables it to cope with changes over the years in your shape and size. Hairs are an invariable characteristic of all human skin except the palms of your hands and the soles of your feet. They do not develop to the same extent all over your body: in some places the hairs are scarcely visible but they are there, rooted deeply at frequent intervals. Only serious and permanent deficiency of your circulation causes them to disappear. Hair and skin both require lubrication and sealing against moisture, so each hair root has its own flask-shaped sebaceous gland which slowly but steadily trickles out a fatty material it produces. Health provides for the regular flow of nutrients to this gland and for their manufacture into sebum at just the pace required for its flow to match the rate at which it matures and dries. Sebum is therefore delivered in prime fresh condition to your skin where its ripening and rancidity are positively beneficial. The healthy rhythm of skin lubrication is easily upset, usually at times of transition in your life. Puberty is the best known, when hormones are actively preparing you for adulthood; but rosacea is the same process at any other time; women near the menopause are sometimes affected. A baby may have a similar condition called roseola which affects his whole body but is usually most intense on his face and neck (which is also where grown-ups are most affected). This happens as his skin adapts its structure to the much drier conditions after birth. Before then he needed lots of sebum to waterproof his skin for life in the womb. Once born he needs far less. The redundancies do not always go smoothly and acne-like pimples may form. It almost never upsets the child, requires no treatment, and clears without a blemish within a few weeks. 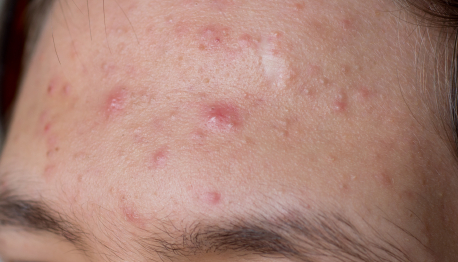 Perhaps teenagers who had roseola as babies are more likely to suffer acne too: no-one has ever checked. These changes all make the flow of sebum more sluggish, so that it can begin to dry and go rancid while still inside your sebaceous glands. These block and swell, forming black-heads. The pressure that builds up inside them causes leakage into your surrounding skin which inflames it. The bacteria which thrive on degenerate sebum are rather aggressive so that painful boils form if they appear and multiply. Rich fatty food makes matters worse. You make the surplus into extra, second-rate sebum which stagnates into acne very easily. 1. Eat the diet for health based on vegetables. Your skin reflects, stores and excretes excesses in your food and will never heal while they keep coming. Medical assurances that food has no effect on acne are based on very narrow, inadequate research. A clean diet can cure it, and always improves the condition, within a period of 6-12 months. 2. Brush your skin all over every day with a loofa or grooming brush firm enough to stimulate and clean it without scratching. Then spend about ten minutes with your affected parts naked or very lightly clad, to let your skin breathe. 3. At another time bathe hot for three minutes, then cold for twenty to thirty seconds; a shower is best for this. You can repeat the cycle several times if you wish but must end with cold. This opens your skin and relaxes it, then firms and tightens it again. You are not only rinsing it but wringing it out! 4. Diet: Use the cleansing diet, especially avoiding fatty food — chocolate, chips, crisps, cheese, cream, butter and meat. You will need to persevere with mainly raw vegetables and fruit for at least six weeks because it takes your skin that long to grow through from its foundations. Rosacea takes even longer. 5. Supplementation: Supplements of Zinc and Vitamins A, B6 (Pyridoxine) and Vitamin C are helpful. Take some Brewer’s Yeast as well to balance the Pyridoxine. 6. Steam your face for twenty minutes daily. Fresh or dried chamomile and hay blossom improve the effect: pour the freshly boiling water over a handful of the herbs. Cover your head with a towel and bend close enough to the steam to feel its heat. When time is up, splash or shower your face with cold water and blot it dry. 7. Avoid using steroid creams on the diseased areas since they contribute to the cause. Salicylic Acid and Sulphur Cream BP are inexpensive peeling agents you can apply to badly affected areas for an hour or two, then wash off: it opens spots more quickly. No other external applications are worthwhile in the end: skin must be cleaned and healed from inside. 8. Tetracyclines are widely used to reduce acne, and work well. But they must be taken continuously and being also antibiotics can profoundly alter your colon bacteria and make thrush a serious risk; this in turn can make acne worse! Only use tetracyclines if your skin is really bad and even then limit yourself to a month: by that time your diet and bathing should prevent further serious recurrence. 9. Homoeopathic remedies Sulphur 6 and Carbo veg 6 are often useful in straightforward teenage cases. You can alternate three doses daily of each, continuing for a few days at a time and stopping if you get a satisfactory result. Resume treatment in the same way once the effect of one course has worn off. The staphylococcus miasm, a legacy of boils earlier in life, misleads the body into forming spots, pimples or boil shapes whether or not infection is present. Psionic medical analysis will establish whether the miasm is present, and prescribe the appropriate homoeopathic remedy.